map the company name to one or more external databases to provide additional information (company size, industry, key contacts etc.). The better services also use geo-location filtering to determine which city the visit came from, rather than providing only corporate headquarters information (e.g., someone from IBM visits your site; that's great, but it would helpful to know whether the visit came from Armonk or from one of IBM's hundreds of other office locations). Critics of these services refer to them as "spyware," though that term isn't really fair. These services don't collect any information beyond what Google Analytics, WebTrends or other web analytics packages do. They can't identify the specific individual who visits a site, only the network location from which the visit originated. The distinction is that they filter out ISPs and supplement network location information with data from third-party sources. What's key is how this information is used. If a marketing group uses the information collected to segment their market and provide relevant, targeted follow up messages, then the services ultimately benefit both buyers and sellers. But if used by sales to make an immediate call ("Hi Bob, I noticed that someone from your office just visited our website. Was that you? If so, I'd like to tell you about a special offer we have going..."), that's where the creepiness factor comes in. These vendors are quick to point out that you've already paid for the traffic to your site through PPC, SEO, interactive PR, banner advertising or other activities; their services simply help you learn more about the 97% of visitors who don't immediately convert into a lead. They aren't so much "lead generation" as they are "lead extraction" services. The bottom line is, with pressure to generate more leads with flat budgets, these services are likely to get increased interest. And again, if the used properly, they can be helpful in engaging site visitors who perhaps aren't quite ready to become a "lead." VisitorTrack, from netFactor—in the company's own words, VisitorTrack is"like caller ID for your website...(it) integrates Website Tracking, Business Intelligence and Sales CRM into a powerful on-demand application for capturing detailed information on your website's Business Visitors." VisitorTrack service provides robust geo-targeting (so you know exactly where visitors are coming from) and email notification, but it's biggest strength is detailed and customizable reporting capability. Contact names are available free through LinkedIn or on a pay-or-play basis from Jigsaw. Pricing starts at about $300 per month. Demandbase—referring to its service as a "lead quality platform...that unlock(s) the potential of online advertising, search, CRM, and social networks," Demandbase provides both a desktop wideget similar to a stock ticker that displays website vistitor information in real-time, as well as daily summary emails and 90 days worth of visitor data for reporting. Demandbase is a simple, elegant lead enhancement solution with an affordable starting point at under $200 per month. You can use the widget for free, but won't get any data stored for reporting. The platform only provides data on North American visitors for now, though international tracking capability is in the pipeline. LEADSExplorer from Engago Technologies is a powerful service that helps marketers discover who's visiting their site, identify their interests, segment visitors based on company size and industry, track results through reporting, and integrate visitor data with backend CRM systems. Based in the U.K., the LEADSExplorer staff is sophisticated about website lead capture technologies and practices, and easy to work with for both U.S. and European countries. LeadLander is one of the most mature providers of what they term "real-time customer intelligence." LeadLander is a robust, proven platform that shows you who's been visiting your site, what they've been looking at, how much time each visitor has committed to reviewing various pages of your online collateral, the search terms used to find your site and more. It's also fully integrated with Salesforce.com. 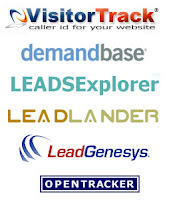 LeadGenesys offers broad functionality for tracking email campaigns and website visits. The service is integrated with Salesforce.com and is used by a blue chip customer base including RR Donnelly, Praxair and AMD. Opentracker is a simple yet powerful service that provides real-time visitor monitoring, search term analysis, online reporting and other analytical capabilities. While it doesn't offer all the features of other services, Opentracker offers smaller companies an extremely affordable entry point into post-click marketing starting at about $20 per month. Forrester's Laura Ramos provided an excellent summary of what she broadly termed lead automation management in August of this year, though it seems a bit odd to place Hubspot (inbound marketing / website optimization), Leadlander (site visitor tracking) and Zoominfo (an online directory / database) in the same group. Hi, Tom. Great article on lead automation! I'd humbly add, however, that "post-click marketing" includes -- in fact, begins with -- the landing experiences that respondents receive when they first click-through from an ad or email. Not to toot our own horn too much, but that's what my company -- ion interactive -- focuses on with our post-click marketing management SaaS platform, LiveBall. We're usually in between the advertising and the lead automation vendors you mentioned, and our claim to fame is very much a resulted of improved conversion rates -- typically 2X to 4X for B2B lead generation. I checked out LiveBall and it certainly looks like an interesting tool for marketers who don't already good tools for creating their own landing pages. Can you provide any info on pricing? Hi, Tom -- because it's a SaaS platform, pricing depends on the amount of traffic, but the starting price is $995/month. One of the reasons we emphasize the phrase "post-click marketing" instead of just "landing pages" is that, frankly, most landing pages aren't that good. We wanted to create a tool that would let marketers build more sophisticated landing experiences, such as conversion paths and microsites, incorporate behavioral segmentation, and scale up a "long tail" of landing experiences to match long tail advertising campaigns. Of course, once leads are generated through a system like ours, it makes great sense to turn them over to a lead automation system -- per your post. One we've worked with recently for a few clients is Pardot and have been very impressed with them. HTMLProtector is a tool to protect the content of your web page and prevent others from viewing or using your source code. It can also stop spam robots from extracting email addresses from your pages and prevent users from using page downloaders to download your entire web site to their hard drive.